The definitive exploration of Homo Sovieticus can be found in the non-fiction world of Svetlana Alexievich. Svetlana Alexievich has spent the past 35 years exploring Soviet identity through the more challenging and less charted terrain of the interior life. Through real voices, she explores the psychological journey of the Soviet, and more importantly, post-Soviet, people. Alexievich was considered a strong candidate for the Nobel Prize for Literature in 2013 before Alice Munro was awarded the prize. Her new work “Second-Hand Time, the Modern History of Russia and the former Soviet Union in Dramatic Confessions,” has been recently published in Russia, Sweden and Germany. In this interview with Rossiyskaya Gazeta, the writer talks about her oeuvre, overcoming the Soviet legacy and challenges of the new era. I explore "home" socialism because all official socialism disappeared along with its rituals and dress. But it remains in the depths of human beings. We boldly and naively thought 20 to 25 years ago that it would be easy to part with that terrible, almost inhuman experience. 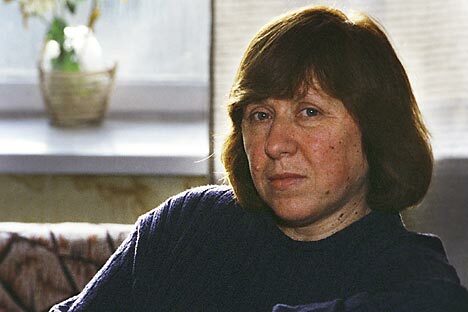 Svetlana Alexievich was born in the Ukraine and later moved to Belarus. She graduated from the Department of Journalism of Belarusian State University. She has written "War's Unwomanly Face," "Zinky Boys," "Charmed Death," "Chernobyl Prayer," "Last Witnesses," and "Second-Hand Time." She has received many awards, and in 2013 she was awarded the Peace Prize of German booksellers. But as it turns out, it's not. The "red man" is still alive in us. This inner "red man," according to the confessions collected in your book, is a complicated creature. I'm not making excuses for him. I just think that we treated him rather roughly in the past. Everything was destroyed without giving serious thought about planning for the future. I'm not an apologist for the Soviet era, but I think it's too bad that we haven't analyzed the value of the things that blood was shed for. I prefer a social-democratic society. I lived for several years in Sweden and saw the availability of many benefits, administration by the state, and the equality of people. Wouldn't a development along those lines have been more natural than what happened to us? Why did the experience of the "red man" suddenly give way to a terrible hedonism? I think that we have a breed of humanity that is not fully developed culturally. All of our cultural energies go towards making grabs for power and achieving something, but no one asks how they should arrange their life, their soul. The higher values, such as dying for ones country and defending it against enemies, never touched everyday life. What are we expending our civic energies on now? To protect the feelings of believers? But nobody is storming the churches. On the debate about gays? But no one has taken away the right of an adult to decide how to live. Maybe civic energies should be directed towards learning to live together and enjoying life? How did you find in the choir of human voices the main idea of your book - that we are experiencing a "second-hand time"? For 35 years I have been writing a series of five books called "The Red Man. Voices of Utopia." "Second-Hand Time" is the final book. This is a metaphor for our ineptitude for the new. We were incapable of this new life, did not find we had the strength for it or ideas, or desires, or experience. During Perestroika, we thought we'll just keep talking about it and will have freedom. But it turned out that freedom is a hell of a lot of effort. We somehow always think that if we shed blood for lofty ideals, some kind of true and new life will come. There are many expectations like that in Russian literature. But a "new life" is long, boring work. Second-hand time is a time of the old, old prejudices. Europe has thousands of small groups, communities, that are always talking about improving their cities and homes, how to raise their children, how to help the starving people in Africa. Spending your time in this way produces a certain quality in the soul. And we don't have this. And for some reason, everything builds directly into hate. Once again, we are doing what we know how to do – determine if someone is "an enemy of our cause or friend." That's the way half the country thinks. If we have a difficult legacy, and we get caught up in patterns of behavior, how can a different "inner man" be born? Russia is big, and it is impossible to take everything under control and iron out the experience of freedom. New people are appearing with a civic courage. The new generation has different ideas about everything. Many of the heroes of my book, when their friends were put in prison for samizdat [self-publishing prohibited books] thought that the most important thing was to open the door of freedom. And when the door of freedom opened, people ran in the opposite direction. They wanted to get dressed, put on shoes, and go to Antalya for a vacation. From all of these dressed and rested people, such monsters appeared! And we feel that we were not ready for this change. It is one thing to fight a huge monster and win, but another to discover it had hundreds of offshoots. In some ways it was worse. And we do not have the cultural skills to deal with them. But 20 years have passed, and the silence of the intelligentsia and the elite must end. It is time to speak out.